I spent the morning working on my Charleston blog post. I have hundreds of photos to go through, and I know I won’t finish until tomorrow. Instead of leaving the blog post-less today, I wanted to share my delicious lunch. I haven’t done a lot of recipe dedicated posts in a while, but now that Spring is here, I’ll start doing more! I love to cook and bake during the warmer months. My recipes are always simple and quick. I’ve mentioned my frustrations with weight during race training. So many of you guys reached out to let me know that all of my struggles are common and eventually my body will go back to normal. You’d think that running long distance, short distance, doing yoga, going on long walks, circuit training, and healthy eating would help me maintain my weight, but I’ve managed to put on seven pounds. I understand that the number on the scale means nothing, but my clothes are tighter and I’m much thicker. I eat clean and practice moderation, but sometimes the body does what it wants to do. I feel so much stronger, and I’m proud of how far I have come, but I’d be lying if I said it didn’t bother me now and then. I have to remind myself of where I was and where I am now. I don’t want to choose being “skinny” over being a “strong” runner. I won’t let myself get to that point, and I think being open with you all is helpful. No one is perfect. I will continue to run distances, crush my circuit workouts, and I’ll let the body do what it wants. I’ve been trying to time my carbs. I eat my carbs before my workouts and recover with high protein meals/snacks throughout the day. One of my friends, who is a nutritionist, recommended this method, and I’ve been trying it out. I have a fun circuit class I’m attending later tonight, so I’ll have my carbs before that, but for lunch, I had a delicious low carb + high protein meal! 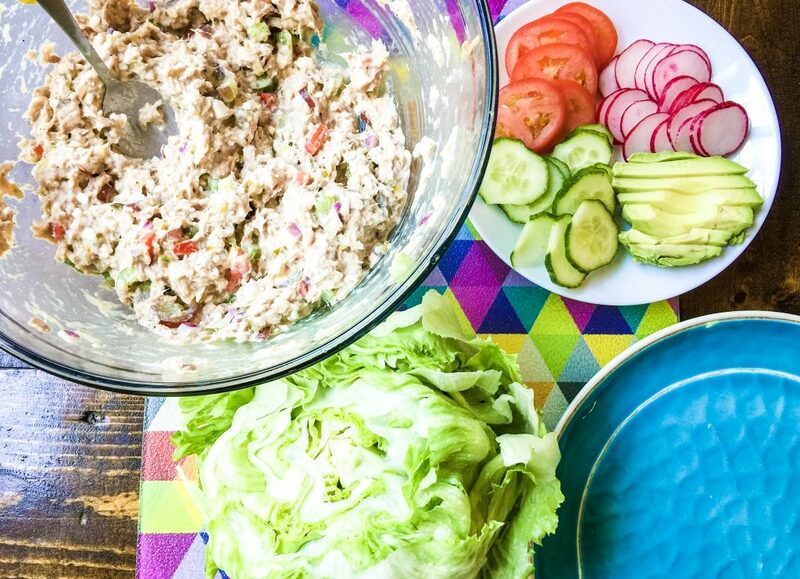 My brother taught me how to make a light and delicious tuna salad a couple of years ago, and I have been hooked ever since. I use this recipe to make a chicken salad as well. 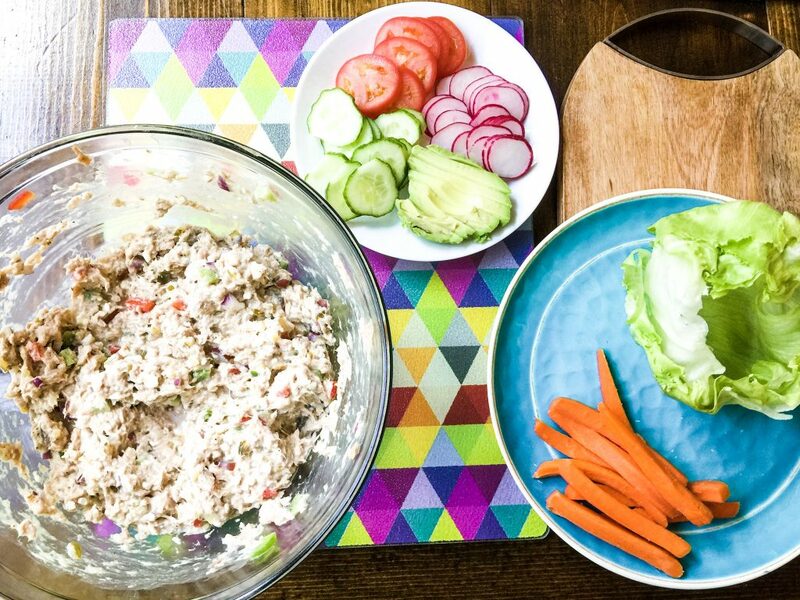 I like to eat my tuna on top of veggies, in lettuce wraps, or with crackers. 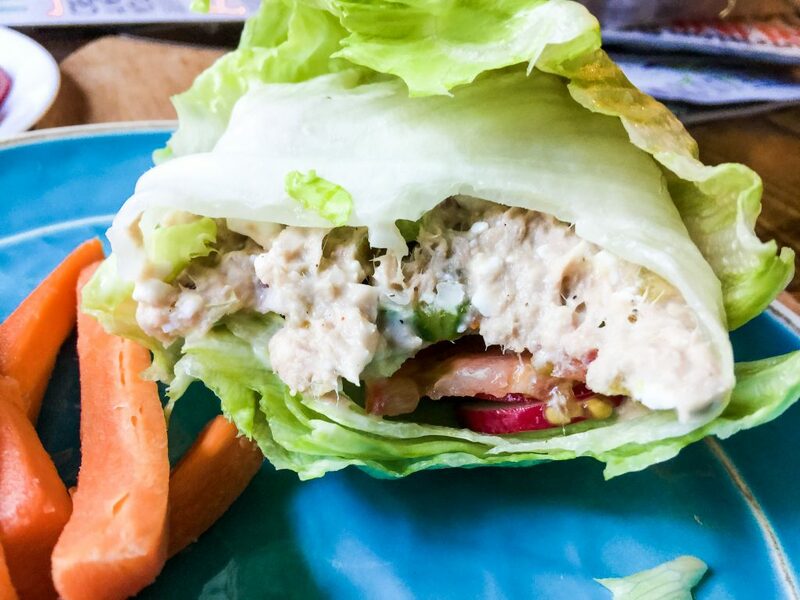 Today, I had my tuna salad in a crunchy lettuce wrap. 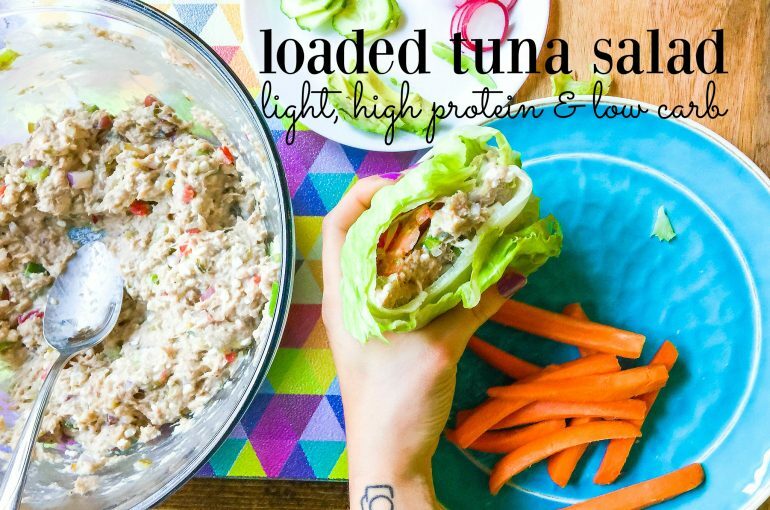 Light, High Protein, & Low Carb! Add all of the ingredients to a large mixing bowl and combine. Gradually add in the seasonings! I added a little sprinkle of each and tried it until it met my tastebud's needs. Slice avocados, cucumber, radishes, and tomatoes. 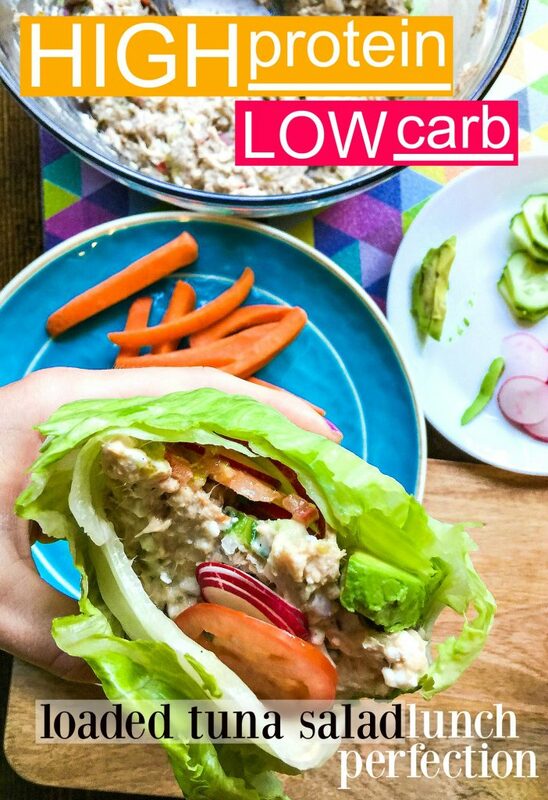 Add 1/2 cup of the tuna salad into a lettuce wrap. Top with avocados, cucumber, tomatoes, and radishes! I even added a little yellow mustard. Ingredients: 4 cans light tuna in water, 3 tablespoons sweet relish, 3 tablespoons red bell pepper, 3 tablespoons green bell pepper, 2 tablespoons chopped red onion, 3 tablespoons red grapes, 3 tablespoons 2% cottage cheese, 4 tablespoons light mayonnaise, sea salt, black pepper, onion powder, garlic powder. Toppings: iceberg lettuce wraps, avocado, Roma tomatoes, radishes, cucumber. Add all of the ingredients to a large mixing bowl and combine. Gradually add in the seasonings! I added a little sprinkle of each and tried it until it met my tastebuds needs. 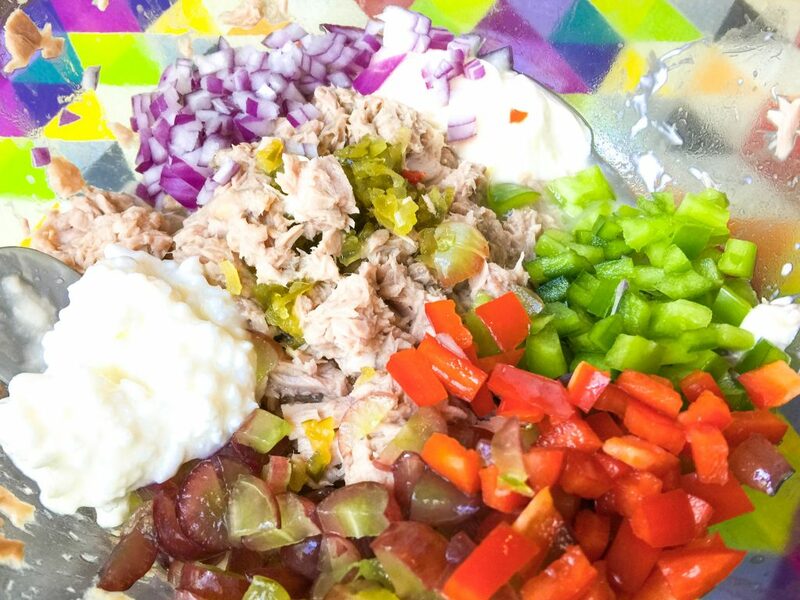 Refrigerate tuna salad for fifteen minutes, or freeze for eight. It’s better when it’s cold! 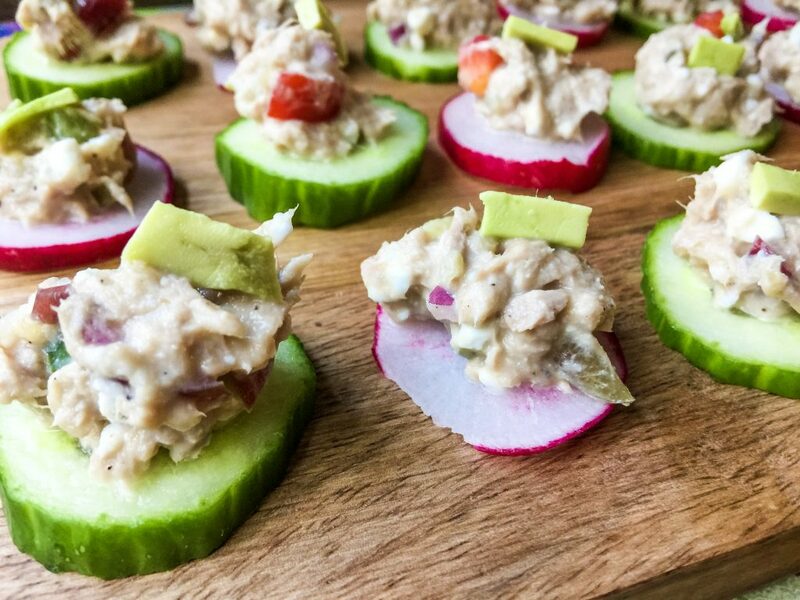 I had to include another fun snack idea for the tuna salad! 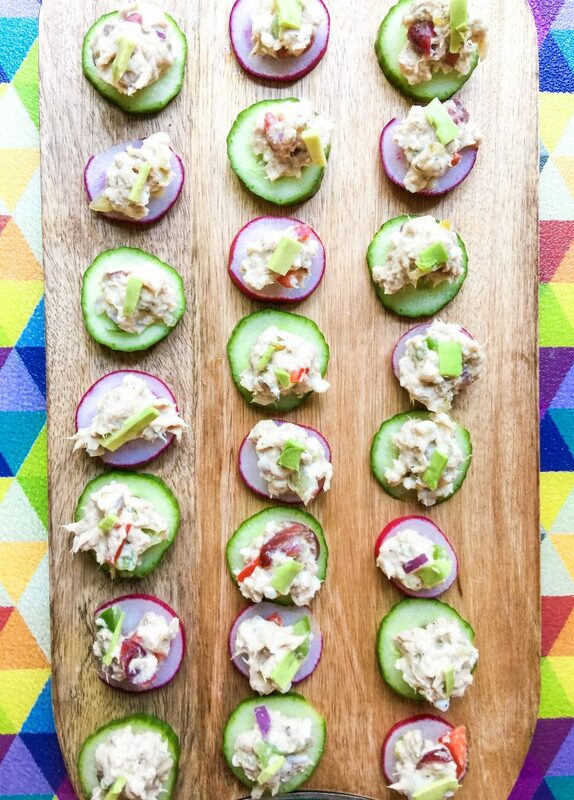 I had some extra cucumbers and radishes, so I sliced them and topped them with the tuna salad! They were so crunchy and delicious. This would be a great post workout or late night snack! What is your favorite high protein snack? 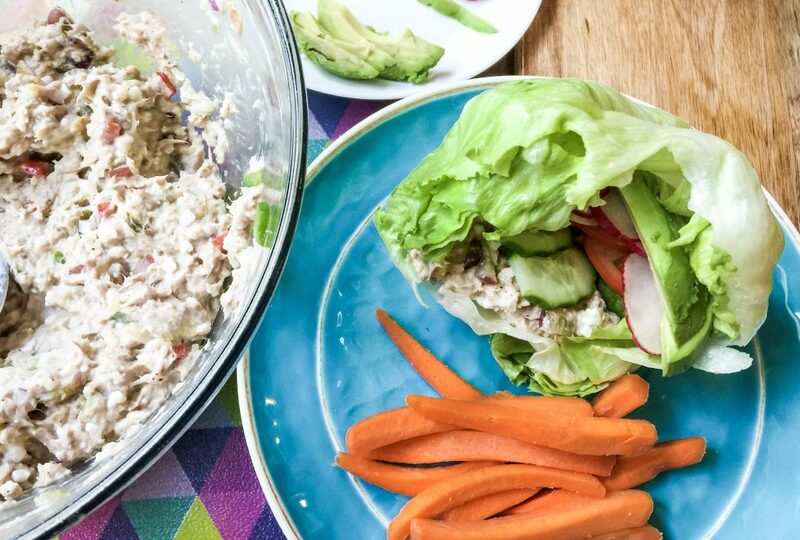 Do you like tuna salad or chicken salad better? I absolutely prefer tuna salad over chicken salad. I have zero idea why, because I love chicken! My family has our own recipe for relish so we’ve been eating that in our tuna and chicken salad for as long as I can remember. It was like a Sunday post-church lunch staple for like, my entire childhood! In college, I developed a necessary love for tuna melts because they were my go-to hangover remedy. We had a Which Wich on campus and I had a friend who could give me the hook up so he’d put extra cheese and extra red onion for me so I would run there and grab a sandwich before my first class if I’d had a LITTLE too much to drink the night before haha. Now that I’m watching my carbs, I love the little tuna on-the-go packets with some crackers! I gained weight when training for my half marathon too! Like you said, the body will do what it wants to. You will go back to normal after. Maybe try running shorter distance and incorporate more walking and weights. That’s worked best for me. I’ve also found that my body doesn’t respond that great to running, like I thought it would. My legs tend to get thicker and I don’t feel lean when I run more. I like both, but I usually make chicken salad because I don’t keep tuna on hand very often. Lately I’ve been making a chicken salad with chopped chicken, diced apples, chickpeas, dried cranberries and a little poppyseed dressing. It’s so good over lettuce or on crackers! Your tuna recipe sounds really good may I add a boiled egg or two? It can be really tough during race training because you are SO HUNGRY! Sounds like you found a great way to fill up without additional calories. 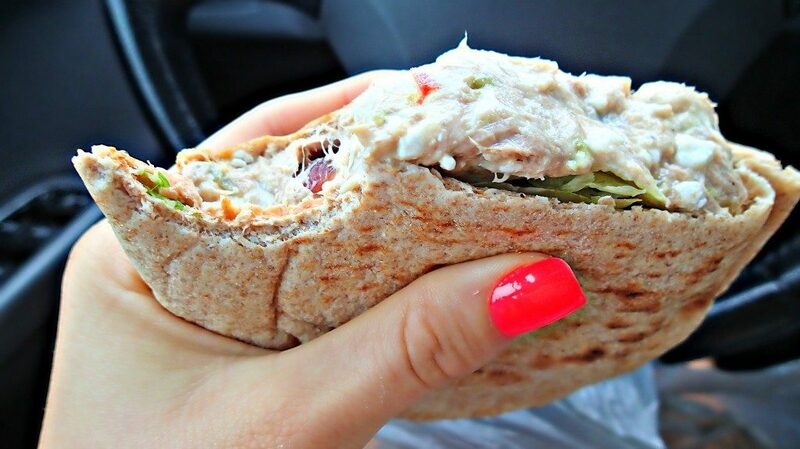 High protein snacks like this wrap are perfect! Do you ever eat rare tuna or raw tuna, Tara? After I run for extended periods of time, I start to gain weight. It helps me jump start whatever things I’m focusing on, but I can’t maintain it. It exhausts me in ways that cycling/walking/ weight lifting/rowing doesn’t even if it burns the same calories and I simply need too much food for what I’m burning off. 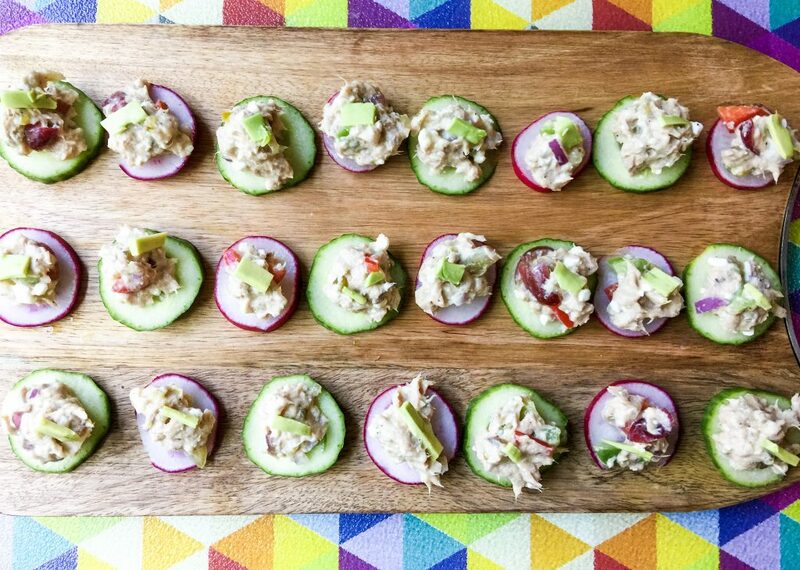 Chicken salad on apple slices is a great snack, or lunch if you don’t want bread. My favorite protein snack right now is Dannon Oikos triple zero Greek yogurt topped with a little wheat germ. I’m burned out on bars and jerky. 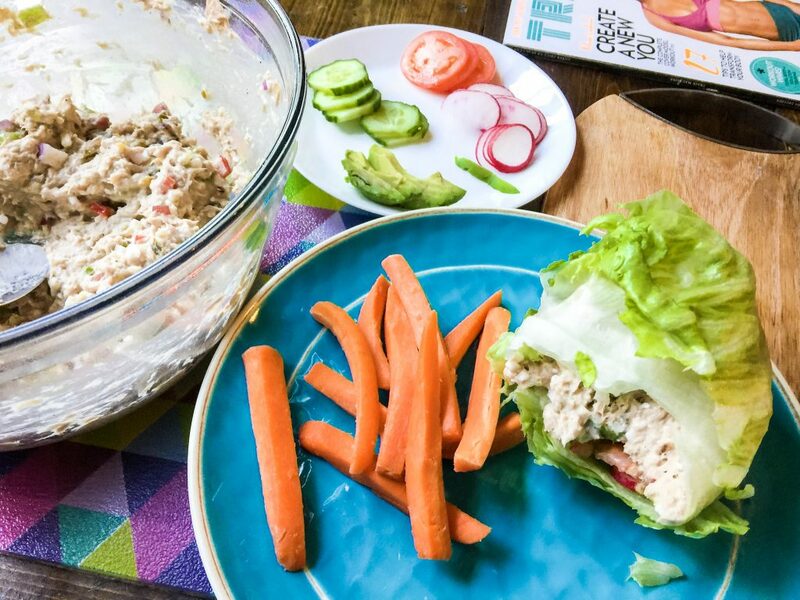 Definitely adding both tuna and chicken salad to the recipe list for the next few weeks! That looks delicious. I forget how easy it is, while also satisfying! And I hear you on the confusion over weight gain. My bottom half has “solidified” in the last few months when I’ve been very active. I don’t own a scale so I don’t know for sure if I’ve technically gained weight, but my jeans don’t fit properly. I waited it out for a bit but finally just replaced my favorite jeans with ones that fit. And it was such a good decision… look even better in the new ones! 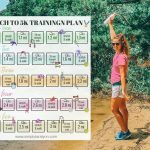 I ran a full marathon 2 years ago and GAINED 10 lbs during training. It was the strangest thing, but everyone on my racing team said it was normal. The weight came off completely about a month after the race even though I did zero exercise during that time. I was told that weight gain during distance running is mostly due to water retention. Someone else correct me if I’m not explaining this right, but water is stored in your liver and muscles in the form of glycogen, which attaches to carbohydrates. Because you have to eat a lot of carbs to train properly, you’re storing more water in your muscles, which leads to a higher number on the scale. On top of that, running long distances, especially when it’s hot outside, means you lose a lot of water through sweating, and your body basically is trying to correct that by holding onto more water. So drinking a ton of water and Gatorade-type drinks is going to help a bit. So the 7 lbs is almost 100% water that will naturally go away once your race is over and you take a break from running. Don’t worry about it! It’s also funny because when athletes are running/training that hard, they’re at their leanest all year! You’re not wrong at all. I read the same exact thing and I know my body is storing extra water for sure!! This happened to me when I started training for my half marathon and it was so weird… I went to see a nutritionist about it because I wanted to know what was going on. She told me that a lot of times when we run long distances our bodies hold onto more fat because fat is the best fuel and our bodies kind of go into stress mode and think it needs to save fuel in case there’s a really long run where we won’t be able to eat anything afterwards. She suggested lowering my fat intake and increasing my carb and protein intake. It helped a little bit and I actually felt more energetic once I did that. She also reminded me to stop looking at the scale and to constantly remind myself of all the amazing things my body can do regardless of my weight. N’aww. It is weird what our bodies do sometimes. Still, strong is good. I was in a workcamp for two weeks, gained quite a bit of weight and as I got back home, I started working out a lot and eating very clean and healthy, but after 3 weeks, instead of leaning out, I still look reaaally bulky. I’m now cutting down on the crazy workouts and sticking to walking more. I hope it makes a difference. My favorite protein snack is probably eggs and I don’t eat tuna, so I’ll say chicken! Yeah, I tend to lean out when I ONLY walk too. I am going to tough it out and continue to go hard at the workouts and maybe focus on a cleaner diet! I just love working out so much, so we’ll see what this body of mine has in store! I just adore your honesty! And I totally get where you are coming from, but I LOVE your mindset. As someone who has gone through an ED before too, I have to continually guard myself against that “skinny girl” mindset and focus on strength. It can be hard sometimes, so I totally get how you feel! I know it’s hard, but some days are just simply harder! Every day is a new day and I feel like a new person each morning I wake up! Fresh start for the mind. LOL, we have the same faves. 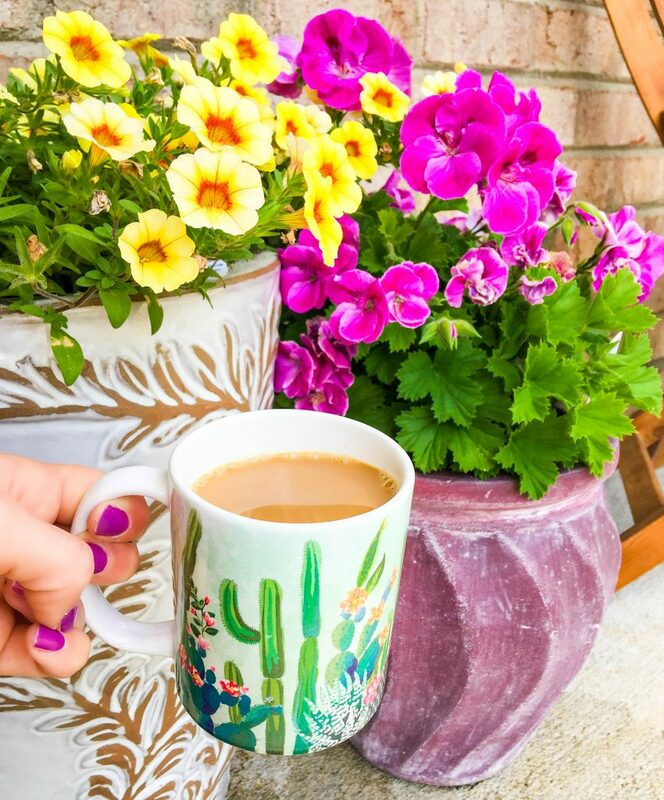 Where is that adorable cacti mug from?! Love it!! It was penned by Robyn, who is a registered dietician, nurse, and now nurse practitioner! 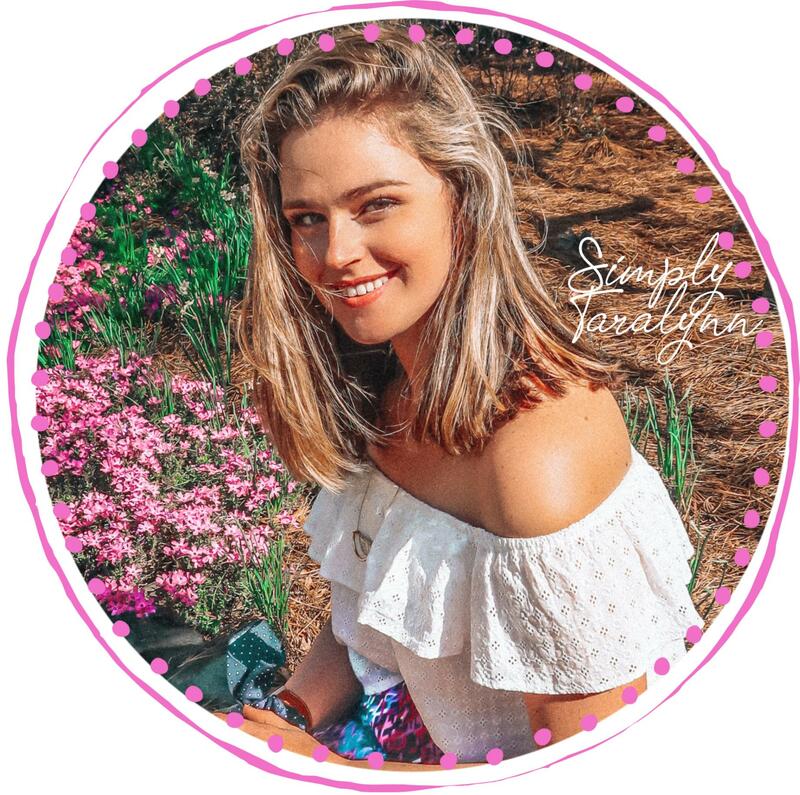 She’s all about a healthy, balanced life, and this blog post is an open and honest story of when she gained 10 pounds despite a very healthy diet and lots of exercise. Spoiler: she wasn’t eating enough calories to keep up with her exercise regimen, so her body had started to conserve calories, leading to weight gain. Additionally, her body needed a rest from the running and the workouts. Again, sorry to hear of your frustrations! That was such a beautiful article and I could relate so much! Thank you for sharing that. She nailed exactly what I’m going through! I love chicken salad! So much! This recipe looks awesome! When you make it, is chicken the only substitute? I’m going to try this tomorrow! 🙂 as for high protein snacks, right now I am hooked on protein shakes! I hated them for so long and I tried the Orgain brand (because of this blog!) and I love them! Is there a certain flavor of the Orgain brand that you guys like best? I haven’t tried it but I’d like to…I haven’t really found a protein shake that I like. Vanilla! I add it to almond milk + frozen bananas! Not at all! You can get creative and make whatever you want! Oh, the Orgain is my fave!!!!! I’m the same age as you and for as long as I can remember have always been maintaining around a certain weight/look. But then I got pregnant haha, while I understand the weight gain and body changes are necessary sometimes it’s hard 🙂 so I totally get what you mean. I’m 8 months preg and now when I look back at pictures I’m like “I can’t believe I felt chubby that day!” But my favorite high protein snack is probably a toasted bagel with avocado and hemp seeds on top! Congrats on your pregnancy! 🙂 How exciting. I do the same thing when I look back at pictures too! That sounds like such a delicious snack! Hi! I’m 21 and ran my first half marathon back in October. I feel your struggle. When I was training for it I went up a pant size. I had to actually buy new jeans because I couldn’t fit into my old ones. Now, I can barely run 3 miles outside but I can fit back into my original pants. However, gaining the weight didn’t matter at all the moment I began that half marathon. I’ve never felt stronger and would love to be able to run that far again, regardless of the weight gain. That is literally how I feel! Crazy how our bodies are. I shouldn’t let it bother me, but living with a mental illness and a previous struggle with weight my entire life, I’d be a liar and a hypocrite if I wasn’t honest about it. I know it’s all worth it and all the miles I’ve been logging are worth it! But sometimes we struggle and it’s ok.
Hi Tara, your recipe looks good ! I am surprised to read you mention you have a mental illness. Following you for a long time now I feel you’re doing pretty good… Hope you’re getting better though. You’ve got this! I have noticed that I have times of year where I just kind of swell up. Usually I am thinner from November to April and start to feel more bulky June thru October. I used to just think it had to do with school but now as an adult without summer breaks, I know that isn’t true! The only year it didn’t happen was the year that I broke my clavicle and couldn’t work out for the whole summer (oddly, I lost about 5 lbs then but it was all muscle weight). Our bodies definitely go thru cycles despite eating and working out consistently. I’m glad you are making a conscious effort not to let it get to you! I agree. Our bodies definitely go through cycles! They’re funny at times 🙂 I certainly hope your clavicle is better! This looks delicious! I feel ya on the weight gain. Running can do weird things…it seems when I run moderately I can lean out a bit, but when I up my mileage to long runs my body holds on to everything it has! And tbh it’s a lot of just trusting that your body knows what’s best for it…annnnd maybe tossing the scale a way for a bit 🙂 Great work with your training thus far! Totally understand it! I’ve read a lot of articles on it and your body stores glycogen to fuel long runs, which can cause weight gain. Plus the water gain! It really has nothing to do with the scale. That number doesn’t bother me. It’s how much clothes are fitting and they are definitely not as lose anymore. Fave protein snack is a boiled egg, clean protein bar, or shakeology. 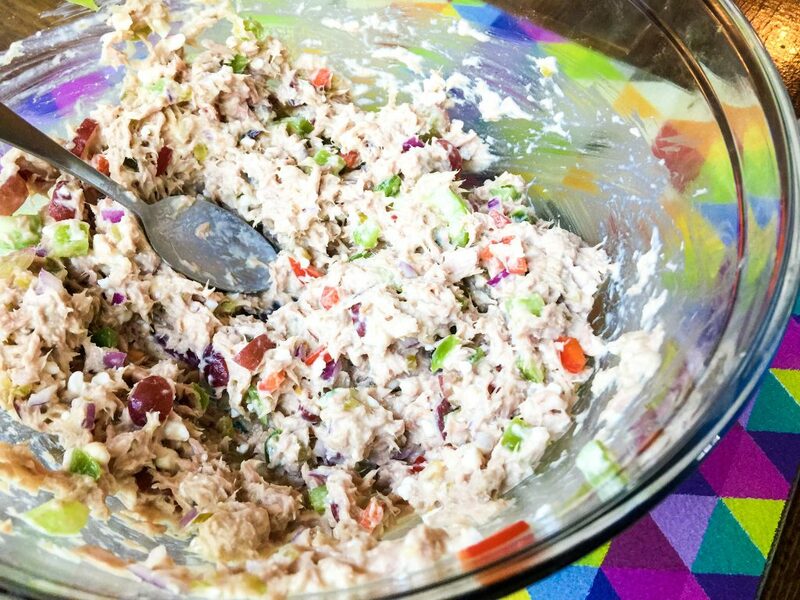 I like chicken salad better than tuna, although my moms tuna is amazing & requested everytime we have a family get together. I make my chicken salad w rotessouri chicken, Greek yogurt, grapes, walnuts, celery or pickle relish if I don’t have celery, & a drizzle of poppyseed dressing. So good! That sounds really good! Love the idea of adding poppy seed! Muscle weighs more than fat. 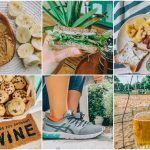 Have you seen the Kayla Itsines BBG movement? If not, look it up on Pinterest. TONS of women will lose inches, tone up, look amazing, but are heavier pound-wise because they are much more muscular. Doesn’t mean they’re not skinnier, because normally they are much smaller but often times will weigh more after sticking with a vigorous exercise plan. Don’t beat yourself up and don’t let the scale define your success. It really has very little to do with it anyway. I understand the whole muscle vs fat. It’s not really the number on the scale. It’s how I feel. My clothes are tighter and I’m thicker. I haven’t lost inches at all. That is why I feel the struggle. I felt more toned before entering the running world, that is what I’m trying to say. Girl you should definitely be lifting heavy! Resistance training is probably the most efficient way to burn calories, tone up, and be really strong. You’ll run way faster, too, since your legs will be more powerful. Lower body work is your best friend. Also, you can eat a lot more since you’ll be burning much more energy. The scale numbers will definitely go up, but it’s not a bad thing. You’ll be torching your body fat % and the weight will be muscle. Don’t obsess over the number. I don’t obsess over the number 🙂 It’s about how I’m feeling and I just have to be honest with myself about it. Charleston Long Run + Weekend & Eats! Site Maintained by Victor Font Consulting Group, LLC.